This week Kelly celebrates the newest fireworks show at Magic Kingdom! 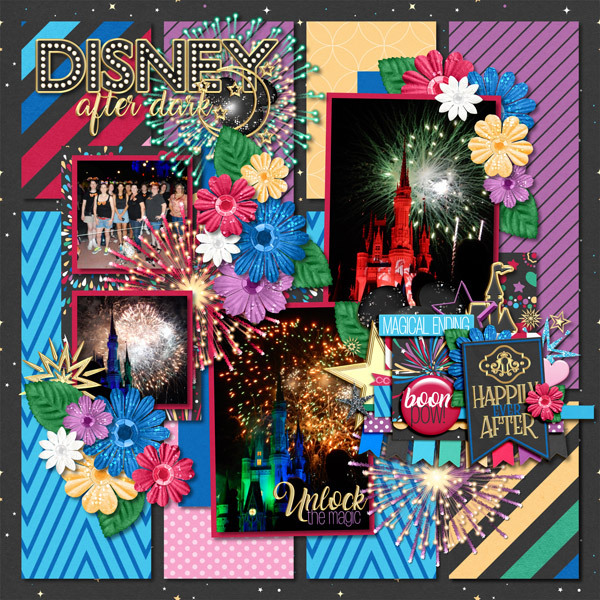 The Ever After Fireworks collection is so gorgeous you are going to want to start creating layouts right now. It’s perfect for the show, but the colors are also wonderful for after dark pictures anywhere else in the world. Be sure to add the explosive Page Starters, Journal Cards, Word Art, Word Flair, and Quick Pages, too! The kit includes 15 neon papers and a full alpha in lights. Over 60 unique elements include castle logo, fireworks, flags, stars, hearts, key, key holes, Mickey head, moon and stars, rockets, and much more! Now how about some gorgeous freebies to coordinate with this new kit? You can find them at Debbie’s Blog and Jenn’s Blog. Have a great weekend and happy scrapping! Kellybell Designs Presents Toy Land Mania!